A lawn is often the centre piece of our gardens. Whether we have a practical space comprising of just a lawn for the kids to enjoy, or a well laid out garden with colourful beds, raised borders, garden buildings and a water feature, everything looks better with lush green grass. In order for us to maintain a healthy looking lawn, a key ingredient is plenty of water. Living in the UK, we’d think that rain was frequent enough to provide most of the water we need. The reality is that in recent years, more watering by hand or sprinkler has become a frequent occupation of those looking to maintain a healthy looking green lawn. At the Waterwise Conference in March 2019, Sir James Bevan the head of the Environment Agency stated that within 25 years, England would not have enough water to meet the demand. This is staggering news as water is something we all take for granted. To emphasise how important it is for us all to change our habits when it comes to water usage, Sir James said that he wanted wasting water to become “as socially unacceptable as blowing smoke in the face of a baby”. During the conference, many harsh terms were used to describe the situation we are facing in relation to water shortage. Expressions like “jaws of death” and existential threat” were specifically applied to garner attention in the hope that we will all take the looming situation seriously and start to make the necessary changes to the way we use the precious resources of our environment. And we need to start planning today rather than putting things off until it’s too late. Controlling how much water is wasted is at the core of solving this problem. But what constitutes waste? Leaving taps running whilst cleaning your teeth or allowing mains water pipes to go into disrepair and leak thousands of litres of water into the ground each day is clearly a waste. But watering your precious lawn that you’ve spent hours and hours maintaining? Sure you can allow it to go brown and die back and it will most likely recover when the rains return, but did you want a brown lawn - probably not. Artificial Grass Lawns are an ideal solution to this environmental quandary. Replacing your conventional ‘living’ lawn with an artificial turf not only guarantees you a green lawn all year round with no regular watering required, but with a permeable surface as opposed to laying slabs or paving, when the rain comes it will be able to permeate the surface of your lawn and top up the essential water table below. Of course artificial grass has many other benefits which help reduce longer term environmental impact. No need for a lawn mower that consumes fossil fuels or the consumption of electricity (however it is generated). No need for your lawn cuttings to be collected by your local authority or taken to the green waste site. And of course lawn mowers have a limited life so they get scrapped every few years. You would miss out on a bit of exercise, but you’ll no doubt find something else to do with all this free time you’ve just discovered. Artificial Grass Lawns are suitable for children, pets and the entire family to enjoy all year round with very little work to do throughout the year to keep it looking in tip top condition. Ready to find out more about Child Friendly Artificial Grass? 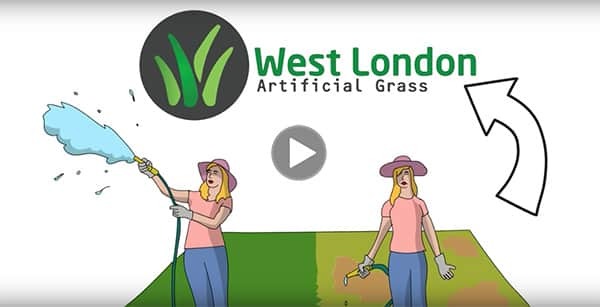 West London Artificial Grass operate in Middlesex, Buckinghamshire, Surrey, West London and all surrounding areas. Contact us to request your personal quotation for an artificial grass lawn today. © 2019 West London Artificial Grass. All Rights Reserved.